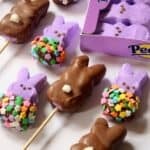 Chocolate- Dipped Peeps combine two of my very favorite things (chocolate and peeps) and make for a fun Easter treat. It seems that people either really love, or really hate peeps. I say, what’s not to love about a marshmallow coated in sugar? YUMM! I like to open a brand new package of peeps and let them air dry for 24 hours or so until they are a little bit hard. I’m telling you, it’s the best way to eat them. Unless of course, you want to dunk them in milk or dark chocolate! 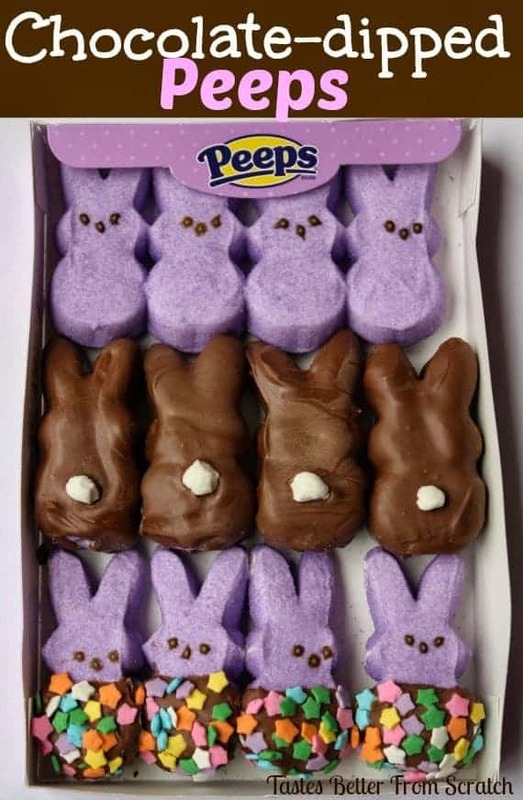 That will take your peep-eating pleasure to a whole new level! You can dip the marshmallow completely in chocolate or try dipping just the bottom half. You can even throw on some sprinkles to make them extra cute and festive. 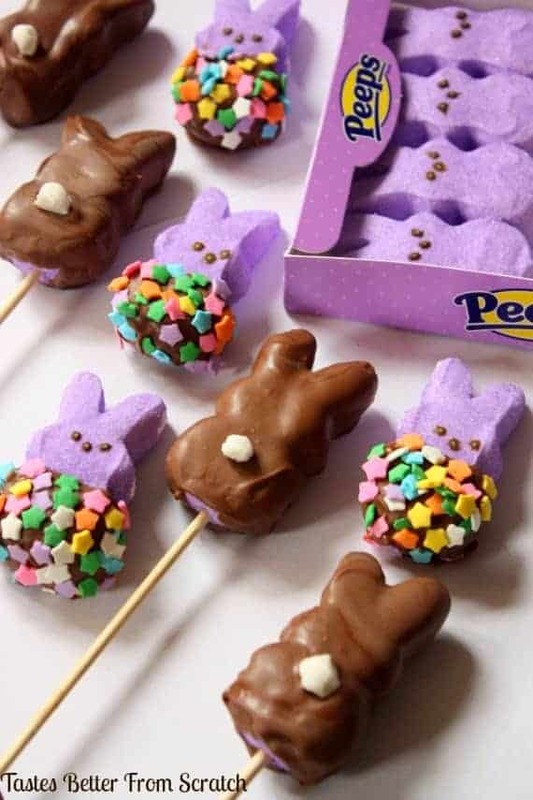 And whether you’re with a group of peep lovers or haters, everyone will probably agree…..Chocolate Covered Peeps? Yes, please! 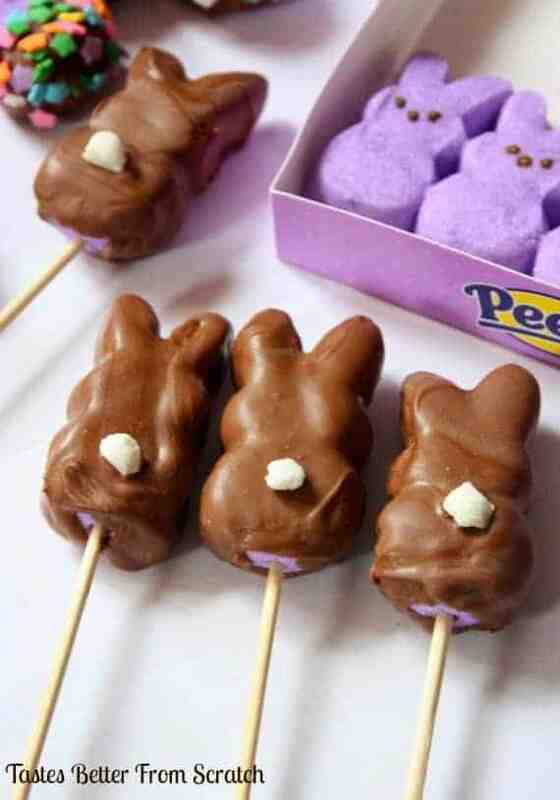 Insert a wooden skewers into the bottom of the bunnies that you want complete covered in chocolate. Place the chocolate chips microwave-safe bowl, and cook, stirring at 20-30 second intervals, until chocolate is melted and smooth. Dip each peep into the melted chocolate until coated on all sides, and place onto the prepared baking sheet. (At this point I added a little piece of white marshmallow to make a bunny "tail"). For partially dipped peeps, just dip the bottoms in melted chocolate, and then decorate with sprinkles. Place on waxed paper. Refrigerate peeps until chocolate is set, about 5 minutes. Yum! Will be making these for easter this year. Thanks for the fun idea!